BELGRADE, Serbia -- A Belgrade court on Thursday quashed the treason conviction of Gen. Draza Mihailovic for his collaboration with Nazis during World War II, politically rehabilitating the controversial Serbian guerrilla commander almost 70 years after he was sentenced and shot to death by communists. For decades, Mihailovic's fate has fueled division in Serbia, where many see him as a hero who died for political reasons. The Higher Court of Belgrade said Thursday that the verdict from July 1946 is now "null and void." The ruling was met with a thunderous applause by dozens of Mihailovic's supporters who filled the courtroom. Dozens more flag-waving nationalist supporters and leftist opponents of Mihailovic gathered outside and were kept apart by riot police. "Thank God for this!" 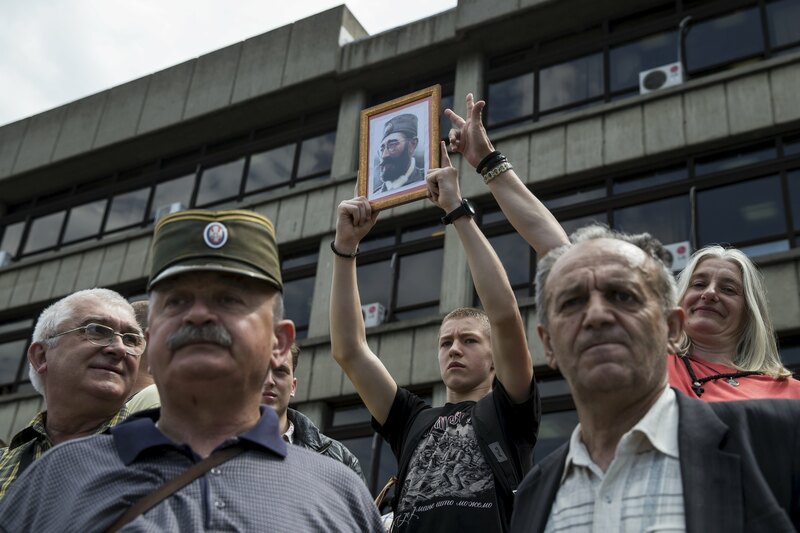 cried Novica Djoric, wearing the trademark beard and black shirt of the so-called Chetnik movement - named after Mihailovic's WWII guerrilla troops. An opponent, Aleksandar Djekic, described the ruling as a "big shame and a mockery of all the victims of fascism." Supporters of WWII Yugoslav communist partisans maintain that Mihailovic collaborated with the Nazi occupiers, and non-Serbs in the former Yugoslavia have accused his troops of atrocities. Historian Srdjan Milosevic described the ruling as "regretable" and bound to cause negative reactions in the Balkan region, still recovering from bloody breakup of the former Yugoslavia in the 1990s when Serbian nationalist troops were accused of crimes against other ethnic groups. As a Yugoslav royal army officer, Mihailovic launched a resistance movement in 1941 against German occupation, before turning against communist guerrillas later in the war. When World War II was over, he was jailed and sentenced to death in a hasty trial. He was buried in an unmarked grave. In 1948, U.S. President Harry Truman posthumously awarded Mihailovic the Legion of Merit for his role in rescuing hundreds of U.S. airmen downed by the Nazis over Serbia.